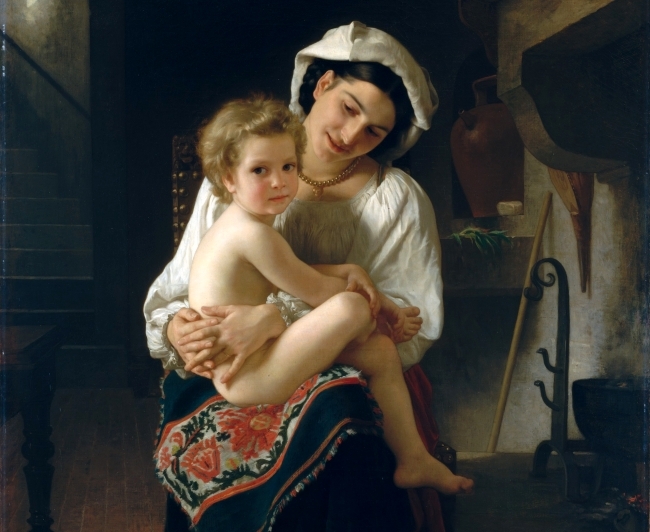 “Young Mother Gazing at Her Child,” oil on canvas, by William-Adolphe Bouguereau, 1871.
be fondled by a man. men will start watching her before she’s fourteen. to intentional types who convert girls to women for sport. Mother, how did I come to be? Did you make me out of rose petals and moonbeams? of men before we know them as our fathers, brothers, or lovers. I will iron her clothes long after she’s old enough to iron them herself. confused one kind of touch for another. (so long as she can withstand the constant, hollow ring). If I could have a daughter, I would implore her to enjoy philosophers and plumbers alike. On Prom Night, I wouldn’t let her back inside the house until she told me about how her date couldn’t get it up and so they’d made out half-naked and bewildered in his car until they got bored and smoked a joint. She could tell me they hadn’t planned to use a condom, had planned to just see where things went and how far, but it wouldn’t matter. She could tell me they’d almost run away together, just because. It wouldn’t matter. I have a daughter is all that would matter. “If I Have a Daughter” originally appeared in Grain Magazine. April served as a guest editor for Pushcart Prize XLI (forthcoming in November). Her short story “Project Fumarase” is among the winning pieces in the previous Pushcart Prize XL. In 2013, April’s debut collection of stories, The Poor Children, won the Santa Fe Writers Project Literary Awards Program for Fiction. April teaches creative writing and French at State University of New York at Oneonta. She grew up in Quebec. This is such a beautiful piece. Thank you.